owners a full De-ice System for the PA-32 Model. Ice Shield™ Wing De-icers work by inflating and deflating tubular channels in the boots. Both the inflate and deflate cycles shed ice. Ice Shield™ propeller boots heat the root of each blade for on a 90-second on, 90-second off cycle to prevent ice buildup. 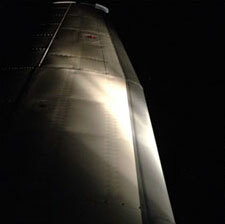 The Ice Viewing light in this system illuminates the left wing for IMC or night flight. This heated panel works as an anti-icer to provide forward vision. owners to select their own system. What is a non-hazard system? 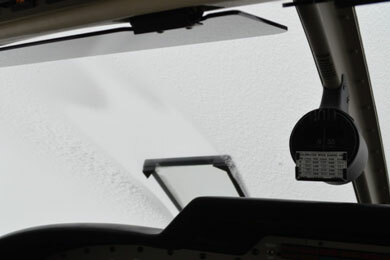 An aircraft with a non-hazard de-icing system is provided with supplemental safety features for use during inadvertent icing encounter, while determining and executing the best available exit from those conditions. B/E's offering for the Saratoga is a non-hazard, de-ice system. What is the difference between a FIKI and a non-hazard de-ice system? Actual icing flight tests are much more substantial for a FIKI certification. In addition, FIKI requirements include redundant electrical and vacuum systems, heated stall indicator vanes and flutter analysis of the airframe. Is this a FIKI system? A customer survey performed by B/E told us that our customers are interested more in safely exiting inadvertent icing conditions than in purposely entering known icing conditions. The cost of the system would have been approximately 40% higher if a FIKI certification had been pursued. 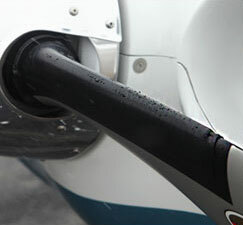 It is a de-icing system certified for Flight Into Known Icing. With such a system, a PIC can enter any forecast or actual reported icing environments. However, please note that there are icing phenomena that can exceed the ability of any known icing system, so pilot judgment is critical, just as it in many areas of decision making. How do I decide whether I can fly in icing conditions? This is a complicated decision, involving many variables. A pilot must consider FAA regulations, current and forecast conditions along with aircraft condition and personal minimums. What advantage does a non-hazard de-ice system provide, other than the obvious 'get out of jail' (aid while exiting icing) support? The pilot is provided more flexibility and security in flight planning. As most pilots who fly in the northern regions during wintry conditions know, AIRMET’s for icing are issued regularly. However, a pilot might reasonably launch on a trip on a day when an AIRMET is issued for 8,000 MSL and above, but encounter icing at 6,000. In such a case, the non-hazard de-ice system provides supplemental safety features for use during inadvertent icing encounter, while determining and executing the best available exit from those conditions. Why would I need a de-icing system at all? This is a personal choice, but the benefits provided by B/E's non-hazard de-icing system include additional security when ice is inadvertently encountered, immediate activation, light-weight and non-corrosive operation. In addition, the value of the aircraft will increase by some portion of the system cost. How much does the total system weigh? Is there a speed reduction? A reduction in speed, if any, would be negligible. Maximum loss would be 1-2 knots, based on conditions. How does the system compare to the TKS™, weeping wings system? One to two weeks, depending upon other services customer may wish to be performed during downtime. Where will the installation be accomplished? At Tiffin Aire, Inc., a well-known and respected FBO in NW Ohio. Can I have other services accomplished during the installation without lengthening downtime? Yes. You should work with Tiffin Aire to arrange details. Billing for supplemental services will be done by Tiffin Aire, separate from the de-ice system billing. Contact number is 1-419-447-4263, 1-800-553-7767, or 1-800-458-2487. What is necessary to begin the purchase process? First, please call us at 1-800-767-6899 or visit the configurator on our website at www.iceshield.com/saratoga to determine your preferred configuration. Next, B/E will provide you with a pro-forma invoice for approval, and will schedule an input date for you with Tiffin Aire. Finally, B/E will collect a $1,000 deposit, and will set the wheels in motion. $1,000 down payment to complete the booking process, and balance due at delivery of the aircraft back to the owner. Click here to see our system Warranty. Your information has been successfully submitted and forwarded for processing. An Ice Shield representative will be contacting you shortly regarding your inquiry.